Springing from a lush British trading colony to the bustling independent city-state it is today, Singapore is like a microcosm of Asia, where you can experience a variety of cultural influences that have melded into a distinct whole. These 13 hotels illustrate Singapore’s cultural richness, from hip modern urban hotels and renovated historic gems to traditional getaways and retreats in the rainforest. Though it opened just last year, Marina Bay Sands has already become a Singapore icon with one of the most distinctive silhouettes in architecture. The $4 billion resort has an infinity pool located 55 stories above Marina Bay, three times the length of an Olympic swimming pool, which is nestled in the boat-shaped ‘Sky Park’ that spans the three towers of the hotel. 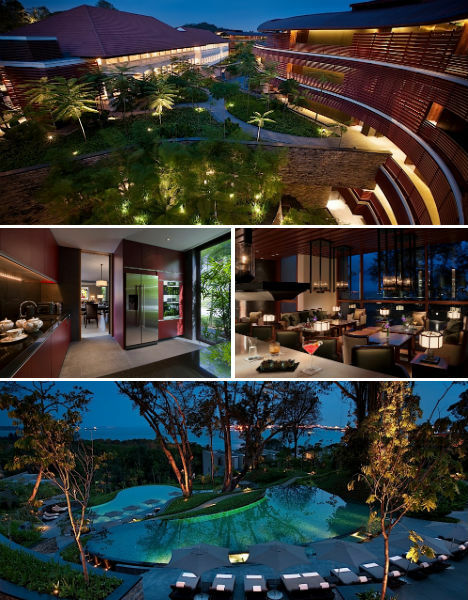 Nestled on a 30-acre property within lush rainforests on Sentosa Island, the luxurious (and pet-friendly!) 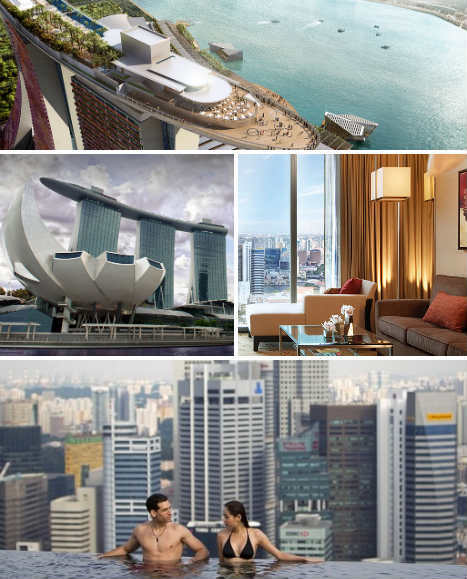 five-star Capella Hotel has three outdoor swimming pools and is located steps from Tanjong Beach. Close to the heart of Singapore and to the Thian Hock Keng Temple, Capella is a stunning way to experience the wild, natural side of Singapore rather than the orderly urban side. The hotel, designed by Foster + Partners, adds curving modern buildings to historic colonial structures including two bungalows dating back to the 1880s. Bold and beautiful in Chinatown, the New Majestic is practically a gallery of local art with 30 rooms – including 9 suites – individually decorated by some of Singapore’s most notable artists and creatives. For example, the ‘Wayang’ room, designed by theater director Glen Goel, features walls upholstered in burgundy silk inspired by the film Raise the Red Lantern. Another room, ‘Fluid’, takes a more modern tack, with fashion designer Wykidd Song embracing white minimalism. 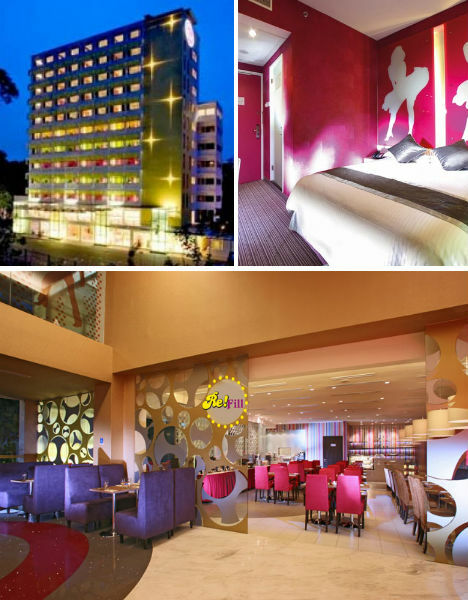 Designed by Ong & Ong, the Quincy Hotel is an all-inclusive business and leisure boutique hotel with 108 slightly different rooms. Long and narrow to fit inside an unusually shaped parcel of land, the Quincy has a distinctive anodized steel facade punctuated with modular windows, a design motif that continues inside with creative lighting. A glass-enclosed pool cantilevered from the 12th floor, featuring a pool deck illuminated with color-changing LED lights, provides a cool and unusual way to experience the Singapore skyline. The Gallery Hotel terms itself ‘art-centric’, hence the name. 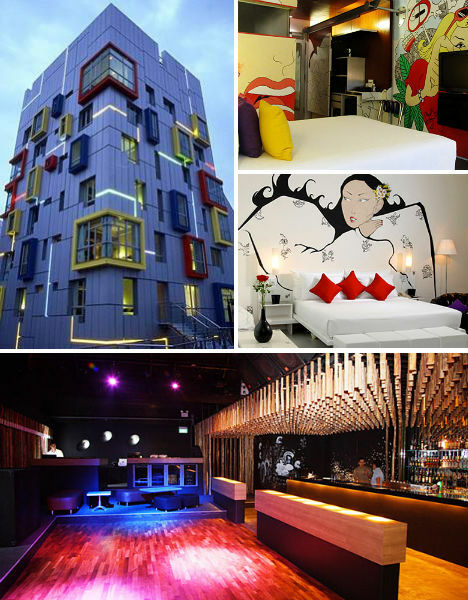 A four-star boutique hotel situated right in the city center, the Gallery has a striking pluralistic facade including randomly placed, color-ringed windows, giving it a Pop Art effect. Inside, it’s just as bright and artistic, with lots of colored lighting and large murals. One interesting feature of the Gallery is a number of all-women guest floors, where men are not allowed – not even staff. Step through the threshold of this clean white colonial building in Singapore’s Club Street conservation area into a bold and graphic boutique hotel that’s easy on the eyes in a palette of black and white. Folds of white fabric buffer the lights in the common areas, and black graphics liven up vast expanses of white walls. The Club Hotel has 22 distinctly unique guest rooms, a rooftop skybar with an alfresco deck and a tapas bar on the ground floor. 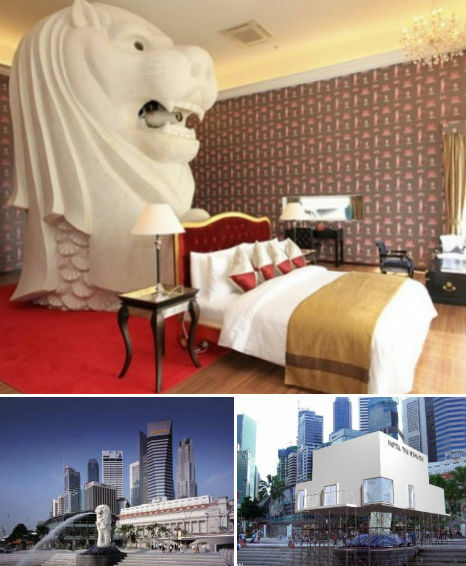 Singapore’s iconic ‘Merlion’ – a massive public statue with the head of a lion and the body of a fish – has been transformed into a temporary pop-up hotel for Singapore’s Biennale 2011, the largest contemporary arts gathering in Southeast Asia. Japanese artist Tatzu Nishi encased the statue in a small hotel that will be available for overnight stays until May 15th and will be disassembled by June 6th. Each floor of the retro-themed Hotel Re has its own bold assigned color, and guest rooms reflect the iconic pop culture of the 1960s and ’70s, including silhouetted wall murals of Marilyn Monroe and John Travolta. There’s definitely a disco vibe going on with all of the reflective surfaces, funky fonts and hot-pink lighting. 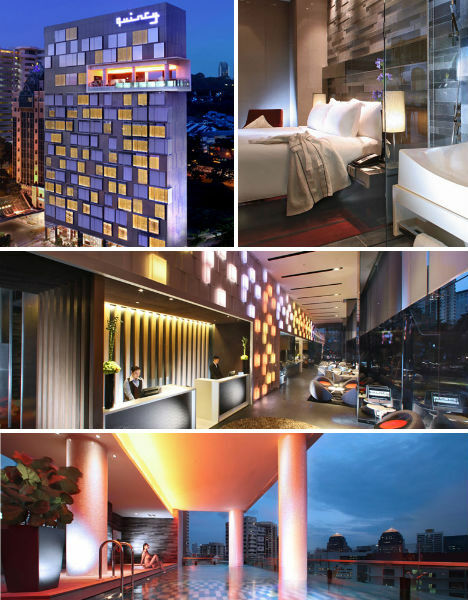 Hotel Re has 140 rooms and 12 stories, located at the base of Pearl’s Hill along Chin Swee Road. Celebrated as one of the world’s most interesting art hotels, the Wanderlust is located in a historic school building from the 1920′s and maintains the original facade – but step inside and it’s like you’re transported to another world. Each of the four-story boutique hotel’s 29 rooms is uniquely decorated including a floor of bright rooms with neon lights on the walls spelling out song titles with colors in them, like Weezer’s ‘Pink Triangle’ and The Beatles’ ‘Yellow Submarine’. Other levels feel like childhood fantasy with treehouse-themed rooms and even space-themed rooms with starry ceilings. The 121-room Scarlet Hotel, housed in a pre-war shophouse in Chinatown, was named by Luxury Travel Magazine as one of the world’s best 5-star city hotels. Decked out in rich reds, gold and platinum, the hotel speaks of luxury and splendor in a way that is sometimes perhaps a little over-the-top ($30,000 beds?) 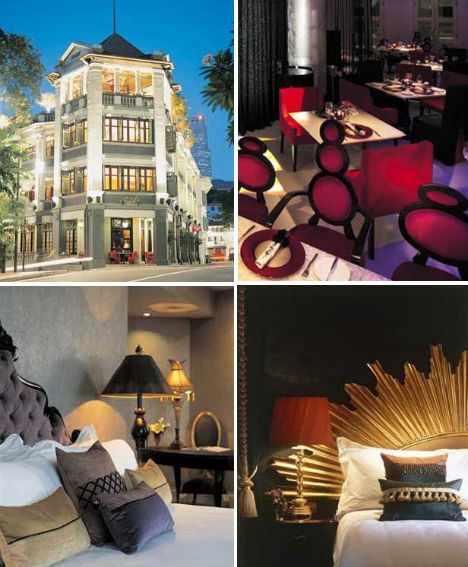 The décor calls to mind Singapore’s colonial past but is injected with plenty of modern details to keep it fresh. 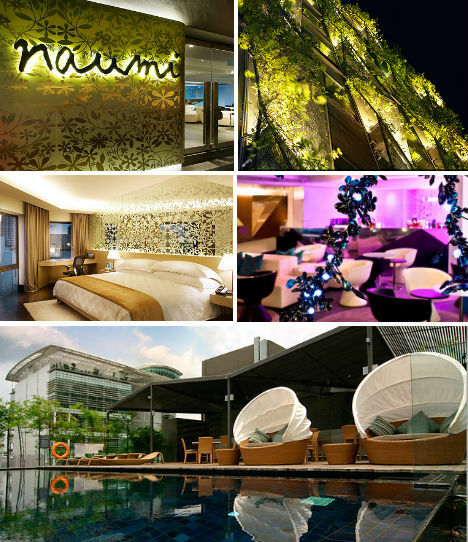 With soothing modern aesthetics and some of the most spacious hotel rooms in the city, the Naumi Hotel is a place of relaxation and retreat. This 40-room boutique hotel in Singapore’s Central Business District has a rooftop pool, restaurant, yoga/fitness studio and an entire floor of women-only suites. Its origami-inspired facade, which incorporates vertical greenery, definitely stands out among the colonial shophouses of Seah Street. 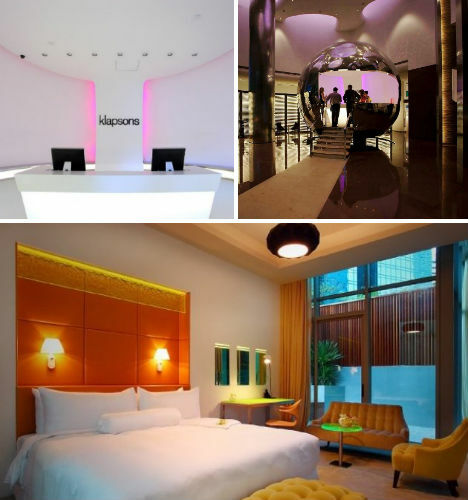 This design-oriented hotel in the business district has just 17 rooms with a subtly futuristic flavor including lots of plexiglass and bright colors. In the lobby, a giant reflective dome holds the reception desk, and the guest rooms, though all different, each have an open bathroom with a cylindrical glass shower. Klapsons includes an alfresco bar and lounge as well as a first-floor restaurant serving Western cuisine. If you want traditional Singaporean luxury, there’s no better destination than The Raffles, one of the world’s most famous hotels with an extensive history dating back to 1887. Occupied by the Japanese during WWII and used as a transit camp for prisoners of war, the hotel was declared a national monument in 1987 and given an extensive makeover that restored it to its former glory. 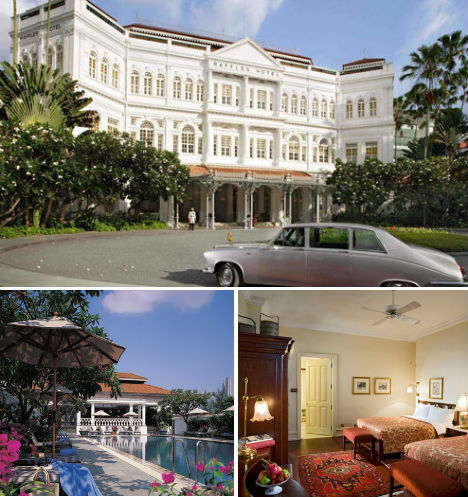 The Raffles is an all-suite hotel with restaurants and lounges, a luxury shopping arcade, a full-service spa, a 66-foot rooftop lap pool and a 388-seat Victorian theater.